TEDDY BEAR'S PICNIC BY JOHN WALTER BRATTON. in Notation and Tablature, for all to enjoy. We can either send you a hard copy of this music, printed on high quality 120 gsm paper, price £3.00 post free. Or we can email you a downloadable file, price £1.30, and you can print the music yourself. Please choose in the options box you will see at the bottom of each page. GUILD MARCH BY C. G. FITZPATRICK. WILD GOOSE CHASE BY JOHN WHITLOCK. HELTER SKELTER BY JOHN WHITLOCK. SNAKES AND LADDERS. BY JOHN WHITLOCK. A BANJO VAMP. A GREAT EASY TO PLAY SOLO. ARRANGED BY RON HINKLE. BEAT AS YOU GO. 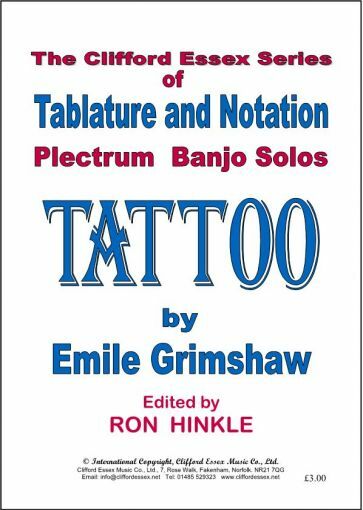 ANOTHER GREAT PLECTRUM BANJO SOLO BY EMILE GRIMSHAW. NEW RAG BY SCOTT JOPLIN, ARRANGED BY RON HINKLE. TATTOO BY EMILE GRIMSHAW. ARRANGED BY RON HINKLE.